Red Cross Volunteer unloading supplies for service center in the aftermath of Hamilton Heights fire. In the last week the Red Cross provided emergency relief in the form of shelter, food, clothing, health services and/or emotional support to 178 New Yorkers impacted by 36 disasters across our region. Here are some highlights. The Red Cross helped over 100 residents displaced by a tragic 4-alarm fire that tore through an apartment building on West 138th Street in Manhattan last Monday, taking one life. At a relief center set up at nearby P.S. 192 on W. 136th Street, Red Cross teams provided comfort in the form of hot meals, health services, emotional support, and other assistance to those displaced. We also provided emergency housing at local hotels to those that needed it. Get an inside look into the Red Cross Service Center setup to assist the displaced residents of the Hamilton Heights fire and meet some of the workers and volunteers responding to this disaster with the video above. Donations to the Red Cross after Sandy are helping fund rebuilding efforts by community-based organizations like Resurrection Brooklyn Relief. This weekend, some great Red Cross volunteers helped Resurrection Brooklyn repair a Sandy-damaged home in Brooklyn. 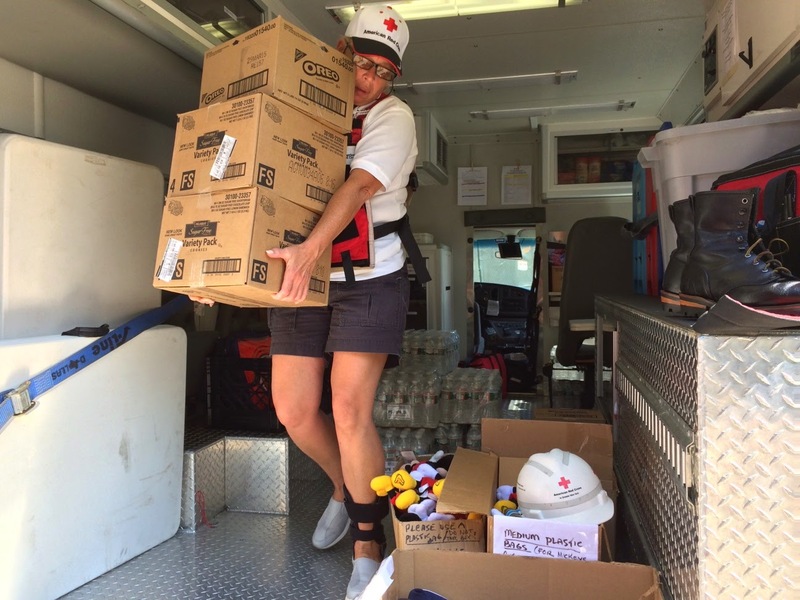 One more Red Cross intern has weighed in with his thoughts on serving with the Red Cross. Read what Conrad Cantor has to say about interning with the Sandy Long Term Recovery team. Yankee fans stepped up to the plate for the Red Cross last week, purchasing reduced-cost premium tickets to the August 20 Yankees vs. Astros game. Sadly the Yankees lost. Happily, a portion of the proceeds of the reduced-cost tickets will go to support the Red Cross humanitarian mission. Long Island Red Crossers, including CEO John Miller, came out in force to attend the game. The Red Cross Middletown Warehouse has been a hive of activity since last Thursday, with a huge cleanup of blankets, bulk items and shelter trailers. Additionally, a total of 530 cots were cleaned, restocked and "palletized" and are now ready for distribution. Way to go, Red Crossers! Kudos to Kelly McKinney, our Chief Disaster Officer, for representing Greater NY in the #IceBucketChallenge to #StrikeoutALS after being challenged by the NYC Office of Emergency Management. Watch Kelly get doused for a good cause!